When we think of extraterrestrial intelligence, we tend to think of two main possibilities. The first is the possibility of mobile, fleshy, protoplasmic aliens not radically different from us (except that their arrangement of flesh would probably be very different). The second possibility is machine intelligence, would might be something like extremely intelligent robots. But there are other exotic possibilities which should also be considered. One very strange possibility is that of a very massive and immobile extraterrestrial intelligence. Such an organism might have a sprawling body that stretches on for many hundreds or thousands of miles, either on the land of a planet or the bottom of one of the planet's oceans. Instead of having just one brain, the organism might have many different brains, each connected to the massive body. 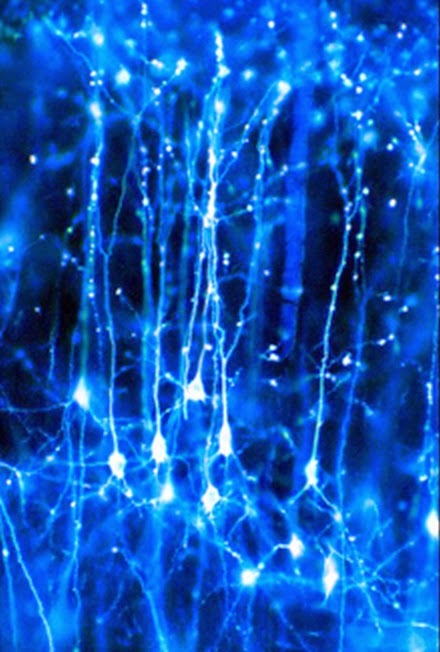 Viewed from above, the organism might look a group of human neurons, except that each node in the network structure might be an individual brain rather than just a nerve cell of a brain. We can imagine something like the image below, with each white clump being an individual brain, and the networked structure stretching on for many miles. Such an organism might be far more intelligent than a human, and might last for thousands of years. If one of the brains was eaten by a predator, it would be no worse than a human losing a single brain cell. Another exotic possibility is that of a a gaseous extraterrestrial intelligence. The possibility of a gaseous extraterrestrial intelligence was raised by astronomer Fred Hoyle in 1957, who wrote a science fiction novel called The Black Cloud, about a giant cloud of particles that invaded Earth. In Hoyle's novel, the swarm was a superorganism far more intelligent than a human. There are three ways in which a gaseous extraterrestrial intelligence might originate. The first way is that it might arise from an emission nebula. An emission nebula is one of the many clouds of gas and dust floating around in space. In some of these clouds of gas and dust, astronomers have detected some of the chemicals associated with life or advanced chemistry. 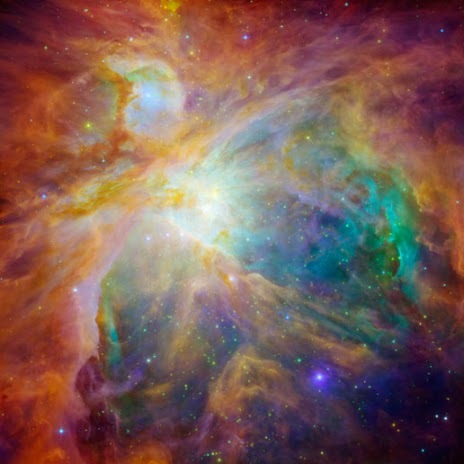 In the Orion Nebula, for example, astronomers have detected water, carbon monoxide, formaldehyde, methanol, dimethyl ether, hydrogen cyanide, sulphur oxide, and sulphur dioxide. It is just conceivable that life might somehow arise in such a cloud of gas and dust. If intelligent life were to evolve in such an emission nebula, it would probably have to be some kind of superorganism, perhaps some kind of hive mind in which many tiny organisms combine to make a larger intelligence. A second possibility is that a gaseous intelligence might arise in some special atmosphere of an alien planet. We can imagine some strange alien planet with super-thick, long-lasting clouds, clouds that were rich with organic molecules. Such clouds might provide a stable environment for the evolution of a gaseous intelligence. But since such an intelligence would presumably not have any technology, we would never learn of its existence unless we traveled to the planet. A third possibility is that some ground-dwelling extraterrestrial intelligence might deliberately convert itself into a gaseous intelligence for the sake of achieving immortality. This would be similar to what was imagined by Arthur C. Clarke in his novel 2001: A Space Odyssey. Clarke imagined super-advanced aliens who first evolved from protoplasmic bodies to robotic bodies, and then eventually evolved from robotic bodies to an immortal pure energy existence. The same goal might be achieved if an extraterrestrial intelligence were to deliberately evolve into a gaseous state. 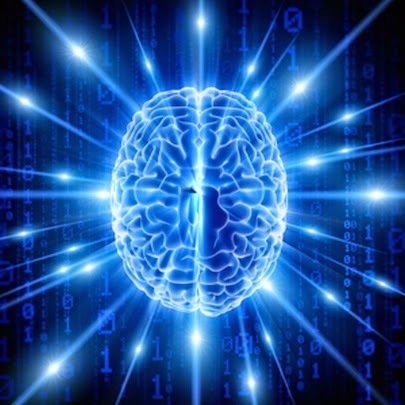 Some would argue that a gaseous intelligent being is impossible, because particles have to be directly connected, like the neurons of a brain are connected. But physicists know of a strange thing called quantum entanglement, which allows for particles that are not physically connected with each other to be co-related just as if they were physically connected. Quantum entanglement might make possible intelligent gaseous beings. If you were an extraterrestrial intelligence existing in a gaseous state, you wouldn't have to worry about various types of accidents killing you. In addition, you might be able to convert yourself back and forth from a gaseous state to a solid state. We can imagine gaseous extraterrestrials with the power to convert themselves into any type of animal known on their planet, or any gender, or a body just like that of any person who had lived on their planet. If this possibility is real, then one day if extraterrestrials arrive on our planet, it might be nothing like the conventional notion of big-headed creatures landing on the White House lawn. Instead, the alien visitors might make their appearance on our planet as gaseous blobs in the sky. In such a case, the weather forecast might be: cloudy, with a chance of alien conquest. Charles Fort was a writer who wrote four books describing strange inexplicable phenomena. One of these books was called The Book of the Damned. For example, he discussed alleged cases of teleportation, poltergeist activity, mysterious disappearances, inexplicable spontaneous fires, UFOs, ball lightning, and cases of fish, frogs, and organic material mysteriously falling from the sky. The title refers to phenomena that have been “damned” in the sense of being excluded from consideration by modern scientists, because the phenomena fall outside of their theories. Fort's works were so successful that nowadays the term “Fortean” is used for such hard-to-explain phenomena. An entertaining web site that discusses such phenomena is http://www.unexplained-mysteries.com/. We might say there is an earthly “Book of the Damned,” and a cosmic “Book of the Damned.” Inside the cosmic “Book of the Damned” are items discovered by astronomers that are all but impossible to explain within the framework of existing theories. One strange example along these lines is the odd case of spiral galaxy spins. All spiral galaxies rotate. A spiral galaxy can either rotate in a clockwise direction or a counter-clockwise direction. The directions are called either left-handed or right-handed, depending on the side to which the bottom spiral arm is pointing. In the picture below, we see the difference between the two types of spin. 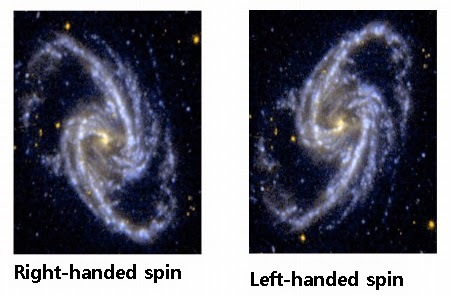 Scientists originally expected that 50% of the spiral galaxies would spin in a left-handed direction, and 50% of the spiral galaxies would spin in a right-handed direction. That is what we would expect to occur by chance. Physicist Michael Longo and his helpers studied more than 15,000 galaxies to determine which direction they were spinning (something that seems like the most tedious assignment imaginable). The end result was very surprising. Instead of finding that spiral galaxies always spin in one direction 50% of the time and the other direction 50% of the time, Longo found that in some parts of the sky galaxies prefer to spin one way or the other significantly more frequently. While it may seem small, such a 7% preference is really huge, when one considers the law of large numbers, which dictates that when you have very many trials (such as more than 1000) the deviation from the expected chance result should be very, very small. The law of large numbers dictates, for example, that if you flip a coin 10,000 times, there is only the tiniest chance that the number of “Heads” flips will be more than 51%. There is no easy way to reconcile Longo's finding with the prevailing assumptions of modern astronomers. So when Longo's results were announced, scientists took the convenient route of thinking: we'll just ignore this, because after all, it's only one study. But then the next year scientist Lior Shamir produced a scientific paper presenting the results of a much larger analysis on spiral galaxy spins. Shamir analyzed 126,501 galaxies, and found that the effect reported by Longo is very real: spiral galaxies prefer to spin in a left-handed direction in a particular direction of the sky. The degree of preference is about the same reported by Longo, about 7%. How could such a thing be happening by chance? There has been talk that a “rotation of the entire universe” might be an explanation, but the suitability of such an explanation is very questionable, and the idea of a rotating universe doesn't fit in with prevailing astrophysical theories. Faced with a second scientific paper showing this mysterious anomaly that spiral galaxies prefer to spin in one direction, did scientists start giving this matter great attention? No. They pretty much continued to ignore the anomaly, putting the finding in the cosmic “Book of the Damned,” where the finding continues to attract almost no attention. We tend to think of science as something that gives us the right answers. Almost always science does give us the right answer. But there is at least one case when science gives us the wrong answer – a really, really wrong answer. In fact, there is one case in which science gives us an answer wronger than any answer that you ever gave in school, even on those tests when you wrote wild guesses on your exam sheet because you had daydreamed through every class session. The wrong answer given by science is the answer that it gives to the question: how much energy is in a vacuum? A person not familiar with quantum mechanics tends to think of a vacuum as being just empty space. But according to quantum mechanics, empty space is not really empty. It is instead a seething froth of very short-lived particles called virtual particles. A virtual particle with mass is a particle that pops into existence and then pops out of existence a tiny fraction of a second later. Scientist think that the vacuum is filled with virtual particles corresponding to every type of actual subatomic particle that has been discovered. For example, they think that the vacuum includes incredibly short-lived virtual electrons, and incredibly short-lived virtual quarks (because both electrons and quarks are known types of subatomic particles). You can get an idea of the modern concept of the vacuum by looking at the animation below. Each of the fleeting little specks represents one of the virtual particles that pop into existence, disappearing a fraction of a second later. Imagine if there was a weird rule in your living room that every second 10,000 fireflies had to pop into existence, but that each of them would disappear a fraction of a second later. You might then then see in your living room these weird little streaks of motion and flashes that would be the signs of short-lived fireflies existing for an instant before disappearing. Scientists think that the vacuum of space is a little like that, except that the fireflies are subatomic virtual particles, so we can't see anything like the streaks and flashes. Quantum field theory allows us to calculate how much energy there should be in the vacuum of space because of these virtual particles. The problem is that when scientists do the calculations, they get a number that is ridiculously wrong. According to this page of a UCLA astronomer, quantum field theory gives a prediction that every cubic centimeter of the vacuum should have an energy density of 1091 grams. This number is 10 followed by 90 zeroes. That is an amount trillions of times greater than the mass of the entire observable universe, which is estimated to be only about 1056 grams. This means that according to quantum field theory every cubic centimeter of empty space should have more mass-energy than all the mass-energy in the entire observable universe. How far off is this calculation? It varies on how you do the calculations. According to one type of calculation, the predictions of quantum field theory is wrong by a factor of 1060, which is a factor of a trillion trillion trillion trillion trillion times. According to a different way of estimating it, the predictions of quantum field theory is wrong by a factor of 10120, which is a factor of a million billion quadrillion quintillion sextillion septillion octillion times. This prediction has been repeatedly referred to as the worst prediction in the history of physics. It could just as well be called the most wrong prediction in the history of human thought. No zealous apocalyptic doomer ever made a prediction more wrong, not even the preacher who predicted the end of the world would occur in 1843. 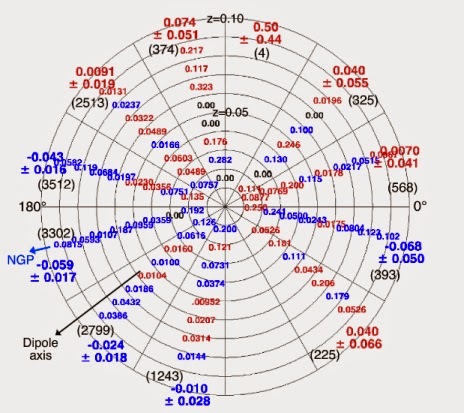 The matter is discussed in this well-written post by physicist Matt Strassler, which includes some nice graphics. Scientists don't talk about this matter very much, as it is something of a skeleton in their closet. But when they do discuss the matter, they refer to it as the vacuum catastrophe or the cosmological constant problem. Scientists think that the vacuum does have a very slight energy density (believed to be the main driver of what is called the cosmological constant, which is causing the universe's expansion to accelerate). But that energy density is less than .00000000000000000000000000000000001 percent of the amount predicted by quantum field theory. Now it might be easy for us to just dismiss quantum mechanics, because of this ridiculously wrong prediction – we could just say, “This just shows that quantum mechanics is all wrong.” But the problem is that quantum mechanics makes many other specific predictions that turn out to be exactly right. So scientists have to try struggle towards some guess as to how quantum mechanics could be right despite its very wrong prediction about the energy density of the vacuum. Another problem is that for you to have an exact balance of positive and negative contributions to the vacuum energy density would require fine-tuning of about 1 part in 1060, which is 1 part in trillion trillion trillion trillion trillion times. It could conceivably be that there are many additional undiscovered types of subatomic particles. It could also be that when one adds up the positive energy from all of the virtual particles corresponding to these particles, and subtracts from that the negative energy from all of the virtual particles corresponding to these particles, one ends up with a vacuum energy density of zero or almost zero. But that would require an incredibly improbable coincidence, one which randomly would have less than 1 chance in 1,000,000,000,000,000,000,000,000,000,000,000,000,000,000,000. It would be like the chance of you adding up all the money earned on planet Earth, comparing it to all the money borrowed, spent or charged on credit cards, and finding that the two sums matched exactly, to the penny – but it would be far more improbable. To say this another way: even though it is possible that there is a special cancellation between the boson fields of nature and the fermion fields of nature, it appears that such a cancellation could only occur by accident, and in only a very tiny tiny tiny fraction of quantum field theories, or of quantum theories of any type (including string theory). Thus, only a tiny tiny tiny fraction of imaginable universes would even vaguely resemble our own (or at least, the part of our own that we can observe with our eyes and telescopes). In this sense, the cosmological constant is a problem of “naturalness” as particle physicists and their colleagues use the term: because it has so little dark energy in it compared to what we’d expect, the universe we live in appears to be highly non-generic, non-typical one. If such a coincidence has occurred, then scientists are using the wrong term to discuss this problem. They use the term “the vacuum catastrophe,” but the word catastrophe means something very bad. The fact that the vacuum is not even .000000000000000000000000000001 percent as large as predicted by quantum field theory, is however, something that is very good, because a very low vacuum energy density is necessary for our existence. If the vacuum energy density was even .000000000000000000000000000001 as large as predicted by quantum field theory, empty space everywhere would be far denser than steel, and intelligent life never could have appeared in the universe. There would be many reasons why suns could never have formed, and if they did exist, the super-dense vacuum would block all sunlight from ever reaching planets. So rather than referring inappropriately to the “vacuum catastrophe,” as scientists do, we should be talking about the vacuum miracle by which a vacuum that is supposed to be super-dense turns out to be not dense at all. 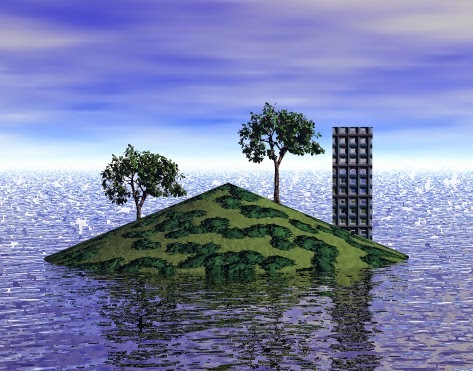 John and his friends had an easy life living on the tiny little island that was their home. They all lived in a luxury apartment building. Whenever John needed some food, he simply had to go to the supermarket at the bottom of the building, and pick out whatever food he wanted. There was no need to pay any money – you just took whatever food you wanted, and walked out. The supermarket was restocked by robots, who also mowed the grass on the island. There was no need to work, and there were many opportunities for leisure – swimming, game arcades, a library, and a bowling alley. John's favorite activity was hanging out with his friends, and trading war stories, tales about the great conflict between the human race and alien invaders. It seemed that everyone John knew had a memory of how he or she had played an important role in mankind's thrilling victory over the extraterrestrial invaders. “We really kicked the hell out of those damn aliens, didn't we?” said John. The 100 humans living on Joe's little island were the only humans left on planet Earth. The alien invasion had been a complete success. With their superior technology many thousands of years more advanced than human technology, the extraterrestrials had little difficulty wiping out almost all of humanity. The plague bombs had got rid of almost all humans, and the few survivors were almost all eliminated by the flying laser robots. But rather than choosing to destroy mankind entirely, the invaders decided to save a tiny little group of human beings, who were put on a little island, a little zoo that could be watched by discreetly hidden cameras. Depressed by mankind's dismal defeat, many of the humans on the island committed suicide. The population of the island fell below the recommended level for the long-term survival of the little human preservation colony. So the alien invaders altered the memories of the surviving humans, replacing their real memories of a crushing defeat with artificial memories of a glorious victory. The intervention worked, and the suicides stopped. Now dear reader, please ask yourself: could it be that one of your own cherished beliefs is as false as the beliefs of these men on this little island? Man: Did you hear that the son of Ted Williams had his father's head cryonically preserved? Woman: Really? So what do you call that, when you have your Dad's head frozen? Man: You call it a Popsicle. How will the future judge us if cryonics works and future historians come to believe that we should have known that it would work? Will our descendants think us monsters for letting so many die unnecessarily? 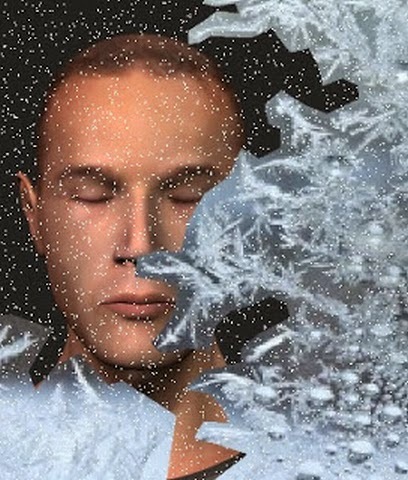 Let us look for a minute at the ethics of cryonic preservation. Imagine you are about to die, and you have $150,000 in your bank account. Is it moral for you to use that money to have your body cryonically preserved? I doubt that it would be a good moral choice. Preserving a body at such a super-low temperature uses up a huge amount of energy every year. The problem is that in today's world, energy use usually requires fossil fuels to be burnt by things such as coal plants. The more fossil fuels that are burnt, the more quickly we heat the planet, and the more we put the environment at risk, making many species extinct, putting many humans (and perhaps even the survival of our species) at risk. Can we imagine how much worse global warming would get if we burned up a lot more coal so that every dead person could be cryonically preserved? The second reason why it would apparently not be moral to have yourself cryonically preserved is that you could use the same funds in an alternate way, and save quite a few lives. You could donate that $150,000 to some charity which fights hunger around the world, or pays for vaccinations. A donation of about $150,000 would save multiple lives, given that there are poor countries where people subsist on only a few hundred dollars a year. By using the money to cryonically preserve yourself rather than donating to a life-saving charity, you are spending the money on a project that merely has a small chance of saving one life rather than making a contribution that will probably save several or many lives. That's not morally sound. Condition 1: You would have to be successfully frozen soon after death. It would not do for you to die 1000 miles from your cryonic preservation company. In such a case, your brain would undergo too much damage before they put you under the deep freeze. You would have to die relatively near your cryonic preservation company, and your body would have to be quickly transported to them. Condition 2: You would have to be successfully frozen in the right way. Your cryonic preservation company would have to take great care to preserve your body in the right way. This would be a dicey proposition, because they might be freezing people for 50 years or 100 years before anyone got around to reviving a body; so no one would know exactly what was the right way to preserve the body (for example, no one would know whether it was some particular chemical that should be injected into the brain, or some other chemical). Also, the staff working for your cryonic preservation company would have to work very carefully, which might be unlikely (since some of them might be thinking to themselves: who cares, the guy's dead). Condition 3: Your cryonic preservation company would have to stay in business until science advanced far enough to allow resuscitation of frozen bodies. This might be unlikely, because it might take many decades until such a time. During such a time there might be all kinds of social and economic upheavals that might lead to the collapse of your cryonic preservation company, plus the possibilities of nuclear war or the banning of cryonics by some conservative administration. Condition 4: The funds you had supplied to the company would have to last until science advanced far enough to allow resuscitation of frozen bodies. Given inflation and escalating energy costs, that might be very unlikely. Once your account balance fell to zero, your cryonics company would probably incinerate or bury your body. Condition 5: Consciousness and memory would have to be based purely on physical brain states, and not on delicate energy states that would be lost during freezing. Your memory and consciousness might depend purely on physical arrangements of neurons, or it might also depend on very delicate electrical and quantum state conditions in your brain. If the latter case is true, your memory and personality is likely to get completely wiped out by decades of low-temperature cryonic preservation. Condition 6: There would have to be no soul that survives death. Based on things such as near-death experiences, apparition sightings, and children who report reincarnation memories, many people believe there is something like a soul that survives death. If that is true, it will not work to try to revive a frozen body. If, for example, your soul has gone on to some heavenly realm, then it will not reappear in your body when someone tries to unfreeze it. Condition 7: Science would have to figure out a way to resuscitate frozen bodies. This part is very unlikely. We have no promising approach here, other than warming a body up, zapping it with electricity and hoping for the best. Condition 8: When they revived your body, the resulting personality would have to be you, rather than a new person. An additional uncertainty is that when they revived your body, you might find that your memory was entirely wiped out. So the resulting personality might not really be you, but some new “blank slate” mind that might really be a whole new person. The probability of all of these conditions occurring would be very low. This is why from a moral standpoint it is far better for you to have your will leave your money to charity than for you to make an arrangement with a cryonic preservation company. Much better to save lives for certain with a charitable donation than to start down some chilly high-tech road that will very probably not save even one life. There was an interview in the New York Times a few days ago with Tim Maudlin. The topic was the relation between religious ideas and modern cosmology. Since Maudlin is a professor of philosophy at New York University, and the author of a book on the philosophy of physics, readers might have expected some keen insights, but what they got instead was very shaky reasoning. Maudlin spends the first part of the interview trying to suggest that cosmology has discredited religious thinking because it shows that the universe is very big, that man is not the center of the universe, and that the universe was not created specifically for the human species. Maudlin asserts, “Theism, as religious people typically hold it, does not merely state that some entity created the universe, but that the universe was created specifically with humans in mind as the most important part of creation.“ This is what is called a straw man argument, an attempt to discredit something by presenting some ridiculous caricature of it. Not many serious astronomically-literate thinkers of the past fifty years have maintained that our vast universe was created mainly for the sake of the human species, or that man is the most important species in the universe. Theism may simply be defined as the belief that some higher power created the universe. The outdated belief that man is the most important part of the universe is an entirely separate belief that is not at all a consequence of theism. Discrediting that outdated belief does absolutely nothing to discredit theism. Our physical theories contain quite a large number of “constants of nature,” of which we have no deeper account. There seem to be more of them than most physicists are comfortable with, and we don’t know for sure whether these “constants” are really constant rather than variable. This gives rise to questions about “fine-tuning” of these constants. One thing to keep in mind is that the true number and status of the “constants of nature” is not part of any well-established physical theory: It is part of what we don’t yet know rather than what we do know...Since we don’t even know if the “constants” are constant, we certainly don’t know enough to draw any conclusions about the best account of why they have the particular values they have right now and around here. Since we don’t know how the various “constants” might be related to each other by deeper physics, the game of trying to figure out the effect of changing just one and leaving the rest alone also is not well founded. These statements are a combination of misinformed falsehoods and irrelevancies. Very far from being “part of what we don't yet know rather than what we do know,” the fundamental constants are some of the more well-understood aspects of nature. We pretty much know everything about them except why they have the numerical values that they have. 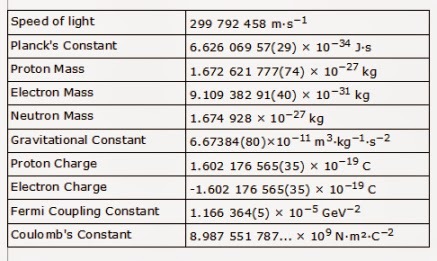 We know the fundamental constants of nature (things such as the gravitational constant, the proton charge, the proton mass, and the speed of light) so well that we have measured their values to six decimal places or more, as shown in the table below. Maudlin's claim that the constants of nature are “not part of any well-established physical theory” is hilarious. The constants of nature are, in fact, fundamental parts of the most well-established theories in modern science: Einstein's theory of special relativity, Einstein's theory of general relativity, quantum mechanics, and the Standard Model of Physics. We also know with a very high likelihood that the constants of nature have varied by almost no amount over the course of billions of years. Studies of quasars and isotopes typically produce a result such as a variation of less than 1 part in 100,000 over a billion years. Whether they vary by a very tiny amount over billions of years is irrelevant to discussions of whether such fine-tuned constants support the idea that the universe was purposefully created. “Trying to figure out the effect of changing just one [constant] and leaving the rest alone” is not a game, but a perfectly serious scientific task which quite a few scientists have engaged in over the past five decades, publishing their results in scientific papers (100 examples can be found here). Far from being “not well founded,” such results are numerically rigorous and as well-founded as any other scientific results. In short, almost everything Maudlin says on this topic is off-base. This argument is irrelevant because whether a creator wants us to know of his existence is a separate issue from whether such a creator exists. It is entirely possible that there exists a creator who is not particularly interested in whether tiny small-brained bit-player creatures such as us are certain of that creator's existence at this point in our development. A theist could also argue that the creator has left signs of his work in nature (the Big Bang, the exact equality of the proton charge and electron charge, the extreme fine-tuning of the cosmological constant, the improbable smoothness of the universe, and so forth), and that the gradual unveiling of such signs over decades (with the help of science) is ultimately more uplifting than some one-shot affair of seeing something like a “God exists” sign in the sky. Perhaps realizing that he has failed to shoot down the idea that the universe's fine-tuning may suggest a cosmic creator, Maudlin then resorts to the favorite last resort of the champions of blind chance: a theory of an infinity (or near-infinity) of other universes. When all else fails, pull a multiverse out of your hat. Maudlin concedes that “this idea is highly speculative, and there is no direct evidence in its favor. “ One might also add that postulating an infinity of universes fails from the standpoint of Occam's Razor (“entities should not be multiplied beyond necessity”), because it leads you to the most complicated explanation possible rather than the simplest explanation. Moreover, a multiverse fails as an explanation because it postulates a situation in which there may be a likelihood of some universe being habitable, but does not change the odds of our universe being habitable, which are exactly the same regardless of whether a multiverse exists. 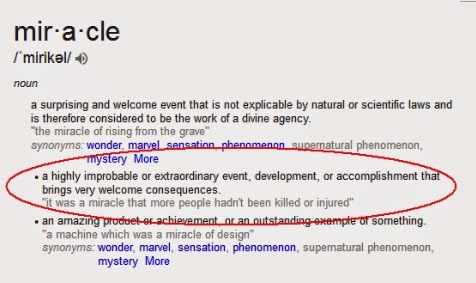 There is also the fact that while we know many things are due to coincidence and we know that many things are due to design, in the history of explanation there is not one verified case of anything being successfully explained by assuming a multiverse; so in that sense a multiverse explanation is not on solid intellectual ground. We may also wonder: if Maudlin doesn't think the fine-tuning of physical constants is such a big deal (as he suggests), then why he is going to the extreme of suggesting a vast number of universes to try to explain it? Discussing whether the Big Bang (the sudden origin of the universe about 13 billion years ago) may support the idea that the universe had a creator, Maudlin says, “I think we don’t know enough to make any plausible guess about even whether there was an initial state, much less what it might have been. This goes beyond what we have good evidence or theory for.” Most cosmologists would disagree with that statement. Such scientists say that we do have good evidence that the universe suddenly began about 13 billion years ago in the event called the Big Bang. The evidence includes the cosmic background radiation and the expansion of the universe (“rewinding the tape” on a universe in which galaxies are all flying farther and farther apart from each other leads inevitably to a point of sudden origin in a state of incredible density). There is abundant evidence that something like the Big Bang was the beginning of our universe, which is why Penzias and Wilson won the Nobel Prize. There may be some small degree of uncertainty in regard to this beginning, a little wiggle room for doubt, but it is not accurate to claim as Maudlin does that “we don’t know enough to make any plausible guess about even whether there was an initial state.” We do have enough not just to make a plausible guess, but to make a high-probability conclusion: the evidence very clearly indicates us that there very probably was a sudden beginning 13 billion years ago. It also indicates that the initial physical state of the universe had "an enormous amount of fine-tuning," in the words of a recent scientific paper on the topic, discussed here. Maudlin also states, “As yet, there is no direct experimental evidence of a deity, and in order for the postulation of a deity to play an explanatory role there would have to be a lot of detail about how it would act.” But, in fact, modern scientists do grant an explanatory role for things for which there is no direct experimental evidence, even when they don't have any details about such things or how they act. Two such things are dark matter and dark energy, both of which are completely mysterious, not understood in any detail, and not things that have been confirmed by any experiment. Scientists are willing to adopt completely vague ideas of the likely existence of dark matter and dark energy, without any details, because they find postulating such things useful in explaining certain hard-to-explain characteristics of our universe. So by requiring a “lot of detail” about an explanatory factor before making an explanatory assumption, Maudlin is setting up some artificially high hurdle for the hypothesis of a divine creator, one that scientific assumptions are not required to meet. Postscript: A huge team of scientists (the Planck satellite team) has just released a paper finding that two of the fundamental constants of nature (the fine structure constant and the electron mass) have changed by less than 1 percent since the beginning of the universe. Galaxies are collections of millions or billions of stars. The two largest galaxies in what is called the Local Group of galaxies are our galaxy (the Milky Way) and the Andromeda galaxy, both of which are spiral galaxies containing hundreds of billions of stars. Both of these galaxies are surrounded by plane-like distributions of much smaller dwarf satellite galaxies. A recent scientific paper says these structures do not fit in with the prevailing theory of galactic structure formation. 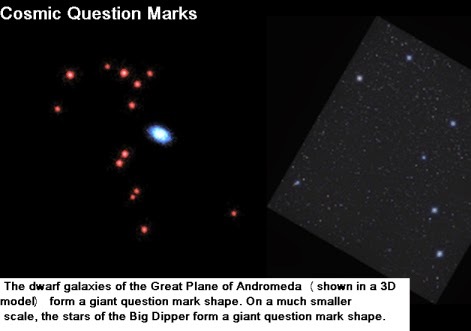 The plane of dwarf galaxies that surrounds the Andromeda galaxy is called the Great Plane of Andromeda. The plane is about 400 kiloparsecs wide, but only about 14 kiloparsecs thick. On this web site is an animated 3D model simulating this vast structure. As you can see from the animation, when you view the plane from a particular angle, the dwarf galaxies in the middle of this huge plane make a gigantic question-mark shape, which reminds me of the giant question mark formed by the stars of the Big Dipper. The structure of dwarf galaxies and globular clusters that surrounds our galaxy is called the Vast Polar Structure or VPOS. It is called polar because it is oriented above our galaxy and below our galaxy, without any matching structure on the sides of our galaxy. 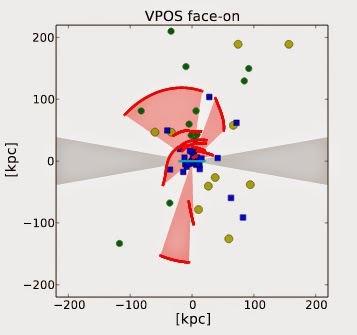 In the chart below (from this scientific paper), each of the blue or brown dots is one of the dwarf satellite galaxies or globular clusters in the VPOS (and our galaxy is in the middle of the chart). 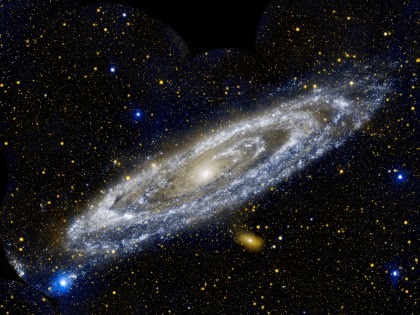 A recent scientific paper points out that both of these two structures (the Great Plane of Andromeda and the Vast Polar Structure) are not what we would expect to exist if the prevailing theory of galaxy formation (the lambda cold dark matter theory) is correct. That theory (which also goes by the ridiculously nerdy name of ˄CDM) has been criticized for being centered around the assumption that there exists a mysterious substance called cold dark matter, the existence of which is still unproven. Merritt's scientific paper concludes (page 18) that under the assumptions of the most popular galaxy formation theory (the lambda cold dark matter theory), there would be only about 2 chances in a million that we would see arrangements of dwarf satellite galaxies such as we observe in the Great Plane of Andromeda and the Vast Polar Structure, occurring near both our galaxy and the Andromeda galaxy. Instead, that theory predicts that dwarf satellite galaxies would form in a more random arrangement around a larger spiral galaxy. So where does that leave our galactic astronomers? It leaves them pretty much caught with their pants down (to use an idiomatic expression meaning to be found in an embarrassing situation). Our galactic astronomers have spent at least 60 years trying to get a good predictive theory of the origin of galactic structure, and they apparently haven't got there yet. We know there are at least four fundamental forces (the strong nuclear force, the weak nuclear force, electromagnetism, and gravitation), but we try to explain the origin of galaxies by imagining that only one of those forces (gravitation) was involved. But the laws of nature we have discovered may be the mere tip of the iceberg. It could be there are major undiscovered laws of nature that played a role in the formation of galactic structure; and instead of there being only four fundamental forces, there may be five, six, seven, or more than ten. If so, our current attempts to explain the origin of galactic structure may be as premature as the attempts of ancient scientists to explain the origin of life. Postscript: See this post for a new related discovery that seems to greatly deepen the mystery of cosmic structure formation. Cal Tech physicist Sean Carroll just released a scientific paper entitled In What Sense Is the Early Universe Fine-Tuned? Since Carroll has taken on a part-time role as a worldview warrior, trying to throw cold water on anyone suspecting that the universe is not the result of pure blind chance, I suspect that some with similar views must have started to read the paper hopefully, thinking to themselves: now finally here is someone who will debunk all that talk about the early universe being extremely fine-tuned. Fine-tuning basically means “fitness for an end,” and the term is used by both scientists and philosophers nowadays in a religiously neutral sense. Using the term fine-tuning does not semantically imply belief in a fine-tuner (although if one is discussing a sufficiently improbable case of fine-tuning that might, arguably, bring to mind the notion that such a fine-tuner once existed). When people talk about fine-tuning of the early universe, they mean the idea that the early universe had some arrangement of matter and energy (or evolutionary trajectory) that was highly improbable, something that was conducive to the eventual appearance of creatures such as us. Discussions of the fine-tuning of the early universe are discussions of the way the universe was about 13 billion years ago, around the time of the Big Bang, when the universe was very, very hot and dense. Cosmic fine-tuning is also discussed in a different context, the observation that the universe's fundamental constants and laws are improbably suitable for the existence of intelligent life. That's a fascinating topic discussed here, but in this post I will discuss only the first type of fine-tuning. Rather than thinking of fine-tuning in the early universe in terms of a horizon problem or a flatness problem, Carroll suggests that it should be considered in terms of smoothness and trajectories. We know that the early universe was incredibly smooth. 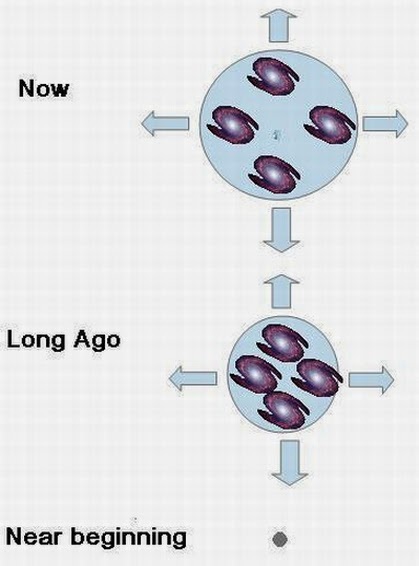 About 380,000 years after the Big Bang, the universe was uniform to 1 part in 100,000. We know that from the cosmic background radiation, which has no lumps greater than 1 part in 100,000. You may get the wrong idea by looking at one of those maps of the cosmic background radiation that show different colors. Those maps are amplifying differences of only 1 part in 100,000. 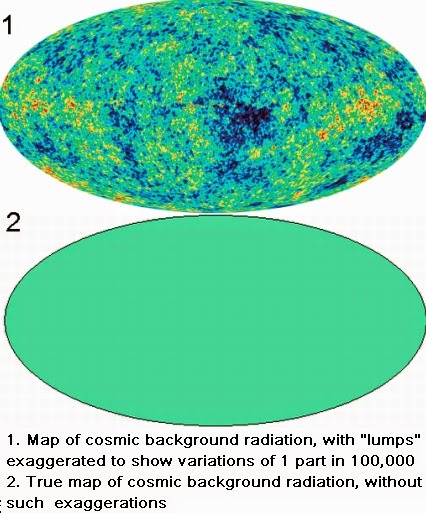 A map of the cosmic background radiation that does not use such an amplification would consist of a single color (see the visual below). But such almost perfect smoothness, Carroll points out, would not occur in more than the tiniest fraction of the trajectories that the universe might have had after an event such as the Big Bang. How small is that fraction? On page 21 of the paper Carroll estimates that “the total fraction of the trajectories that are smooth at early times” is very roughly 1 in 10 to the 66 millionth power. That's a fraction equal to 1 in x, where x is 10 followed by 66 million zeroes. How low is this probability of 1 in 10 to the 66 millionth power? It's a probability much less than the probability of you filling up a huge dump truck with many thousands of dice, having the truck dump the dice gradually along a road, and then finding that each and every one of the dice landed on the road coming up showing the number 6 (with no 1's, 2's, 3's, 4's, or 5's showing anywhere on the road). It's also a probability much less than the probability of you guessing the birth date (month, day, and year) of every person you ever met, and you guessing the correct birth date each and every time throughout your life. Inflation, therefore, cannot solve this problem all by itself. Indeed, the measure reinforces the argument made by Penrose, that the initial conditions necessary for getting inflation to start are extremely fine-tuned, more so than those of the conventional Big Bang model it was meant to help fix. Carroll refers to the famous cosmologist Sir Roger Penrose, who made an argument (based on entropy) that the early universe required fine-tuning even more improbable than the microscopic probability listed by Carroll. We can therefore conclude that the smoothness of the early universe does indeed represent an enormous amount of fine-tuning... The real sense in which the early universe was fine-tuned is extremely simple: the overwhelming majority of cosmological trajectories, as quantified by the canonical measure, are highly nonuniform at early times, and we don’t think the real universe was like that. Clearly, the specific numerical value we obtain is not of central importance; what is certain is that the history of our actual universe does not look anything like it was chosen randomly. I can give a very crude analogy of how mind-boggling this is, one involving a trajectory and smoothness. Imagine you are walking along carrying a white poster board. You walk by a big muddy hole in the street. A big truck speeds by, driving over the muddy hole. Splat! A big blob of mud hits your poster board. Later you analyze the mud splat, and find that the distribution of mud is uniform to one part in 100,000. It's as if someone very carefully sprayed on the mud with a spray can, but even more orderly. How the hell could that have happened? The fact that this result (1 chance in 10 to the 66 millionth power) has been advanced by Sean Carroll may make it all the more compelling, as Sean Carroll (a champion of naturalism) is the type of thinker one might expect to be hostile towards any conclusion of cosmic fine-tuning. Professor Carroll's naturalism forbids him from philosophically connecting the dots in regard to this and other cases of cosmic fine-tuning, but it is not obvious that others should conform to such a prohibition. Scientists have learned more and more about planets by studying them with instruments such as the Kepler Space Telescope. But in five different cases they have found results that leave them baffled – planets that either shouldn't be there or shouldn't be the way they are. 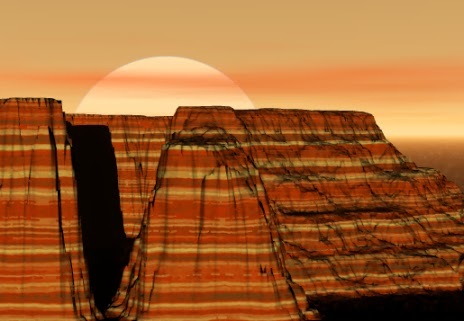 Below is a list of the five most head-scratching planetary mysteries. Gliese 436 b is a Neptune-sized planet orbiting a red dwarf star. The planet orbits so close to its star that the planet's temperature is estimated to be 439 degrees Centigrade. But scientists estimate that most of the planet is solid water – some kind of weird solid water that doesn't melt even at very high temperatures. Scientists also say the planet has more carbon monoxide than it should have. The biggest mystery about the planet, however, is that it apparently has about 7000 times less methane than it should, according to models of planetary formation. GU Piscium b (also known as GU Psc b) is a planet that orbits its star at a distance of 2000 times the distance between the Earth and the Sun. By comparison, in our solar system the dwarf planet Pluto orbits at a distance of about 32 times the distance between the Earth and the Sun. Scientists are baffled by how such a planet could have formed. The prevailing model of planetary formation holds that planets and a star form from a single disk of gas and dust. It's hard to imagine such a disk originally extending 2000 times the distance between the Earth and the Sun. 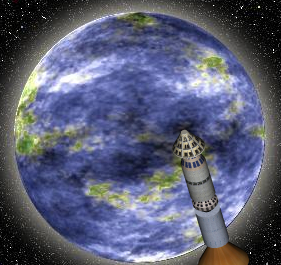 The planet GU Piscium b takes about 163,000 years to orbit its star. Kepler 10c is a recently discovered planet that has 2.3 times the Earth's radius, and about 17 times the Earth's mass. According to planetary formation models, a planet with that mass and radius should be a gaseous planet similar to Neptune. But scientists say that Kepler 10c is actually a rocky planet – a super-Earth bigger than the maximum size of a rocky planet, according to previous scientific estimates. Scientists had a previous notion of the “most massive super-Earth possible,” but Kepler 10c is a super-Earth much bigger than that. Scientists conclude that the solar system which Kepler 10c formed from is about 11 billion years old, only a few billion years younger than the universe. According to prevailing theories, there needed to be quite a few generations of stars before there could be enough heavy elements for rocky planets to form. So how could a rocky planet have formed so early? Scientist Dimitar Sasselov says, “Finding Kepler-10c tells us that rocky planets could form much earlier than we thought.” Could the universe have been on an accelerated development schedule, like some bright kid who skips a grade or two in school? TrES-4 is a planet about 1.7 times the size of Jupiter. “TrES-4 is way bigger than it's supposed to be," says scientist Georgi Mandushev. "For its mass, it should be much smaller. It basically should be about the size of Jupiter and instead it's almost twice as big." Kepler-78b is a planet orbiting the star Kepler 78, a G-class star like the sun, located about 400 light-years away. The strangest thing about the planet is the location of its orbit. The planet orbits its star at a distance of about 900,000 miles, which is about the diameter of the sun and other G-class stars. This is an orbit which places the planet more than 30 times closer to its sun than the planet Mercury is to our sun. The planet is so close to its star that it must be a kind of lava world too hot for life. That's all for my list of the five most inexplicable planets, but perhaps I should add a sixth: our own planet Earth. For this is the planet where there has occurred two all-but-inexplicable things we have never witnessed on any other planet: the origin of life and the origin of advanced consciousness. As discussed here, the origin of life seems nearly inexplicable because a very high degree of sophistication must be reached before any Darwinian biological evolution can begin. You apparently need a genetic code and self-replicating molecules before any biological evolution can occur, but how could those have appeared? Scientists are trying to create models of “chemical evolution” to bridge this gap, but it's not at all clear that the concept of evolution can be carried over in an adequate and meaningful way from the world of biology to the world of chemistry. The origin of advanced consciousness seems nearly inexplicable because humans have so many subtle mental abilities that are hard to explain by evoking natural selection: things such as spirituality, aesthetic appreciation, language abilities, moral impulses, math abilities, philosophical abilities and so forth. Quite a few of these are abilities or traits that have no obvious benefit in allowing a human to survive until reproduction, and they therefore seem to be things that are very hard to account for under any explanation of natural selection in the “survival of the fittest” sense, as I discuss here. This does not suggest that evolution doesn't occur, but may suggest that it can't explain everything about the human mind. We might say, therefore, that none of the astonishing things discovered on other planets is as astonishing as what we know has happened on our own planet. My own view is that the known laws of nature and features of nature are probably inadequate to explain the appearance of life (and particularly intelligent life) on our planet, and that we may need to postulate the existence of additional undiscovered features of nature that could help account for such phenomena. See other posts on this blog (for example, this one) for my thoughts on this topic. In the future virtual reality will be very big. But there will still be groups of people who will want to go out and be entertained together, particularly young people. Such people will still be able to go to the theater and see live actors, or see movies on a flat screen. But such forms of entertainment may seem very old fashioned. Will there be any way in the future for a man and a woman (or a group of young friends) to go out and get some futuristic high-tech entertainment that will seem to transport them to another time or place? Let us imagine a very new form of entertainment that we might call a holographic theater. Rather than imagine something like the holodeck in the TV series Star Trek: The New Generation ( a device which involves incredibly advanced technology you're unlikely to ever see), let's imagine some technology you might actually see within a few decades. The holographic theater I imagine would be a dome of between 10 and 30 meters. In the center of the dome would be a circular or rectangular area that we might call the audience area. All the rest of the interior of the dome would be a projection area. The audience in the audience area would see what appeared to be some other place, typically some place outdoors (although it might also be some vast indoor area such as the interior of St. Peter's Cathedral). It would be a full 3D 360 degree projection, so an audience member could look around in any direction and see the holographic projection (although if he looked down at his feet he would not see the projection). The idea behind the holographic theater is that it would be just like being transported to some other place. For example, you and the person you were dating might go to a holographic theater promising to take you to the top of Mount Everest. After entering into the audience area, you could look around in all directions and see what someone might see if he was on top of Mount Everest. In such a theater there would not be the movie and Broadway theater convention that the audience sits motionless in seats. Instead, audience members would be encouraged to walk around a little, within the confines of the audience area. The area represented by the holographic projection would have to be chosen so that the restriction of movement in the audience area would somehow seem natural. For example, such a holographic theater would not make an audience member think he was in the middle of Times Square, but the theater might make the audience member think he was on a balcony or roof of an apartment building with a magnificent view of a city. Similarly, such a holographic theater would not make an audience member think he was in the middle of a vast meadow, but it might make the audience member think he was on top of a mountain (with no easy climb down from that top). In such a theater there need not be the Broadway and movie convention of a show lasting about 90 minutes or two hours. Since the size of the audience area would be limited (not allowing hundreds of audience members at the same time), it would be better to allow no more than 5, 10, or 20 audience members at the same time, with the show ending after only 10, 15 or 20 minutes. To aid in the “you are really there” illusion, there might be some props in the audience area. For example, if the holographic projection was supposed to show the view from the top of Mount Everest, then some artificial snow might be placed on the floor of the audience area. With a little care and forethought, it might be impossible for the audience member to tell where the audience area ended and the holographic projection began. The simplest way to do such a holographic projection would simply be making the audience member think he is motionless in some place with an impressive view. But with a little more advanced technology, it would be possible to also provide an illusion of motion. If the audience area was set up to look like the deck of a boat, a holographic theater could provide some kind of projection giving the audience member the feel of a boat trip down the Amazon River. Providing the bodily sensation of motion might be a little tricky, but it could probably be achieved with some hydraulics. 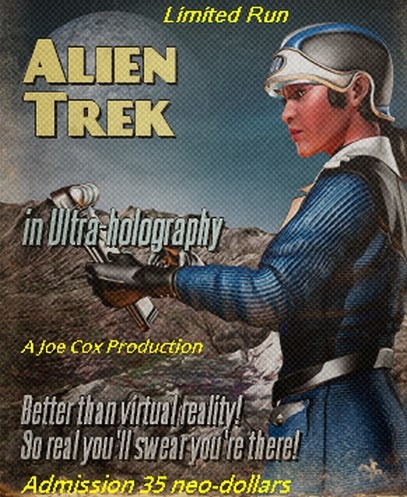 Why would such a holographic theater be more realistic than a virtual reality system? It's because a virtual reality system only offers a small image projection area, about the size of the virtual reality goggles. But a dome of between 10 and 30 meters would allow an image projection with vastly more pixels -- thousands of times more. In such a holographic theater, a story would generally not be presented. Instead of making the audience member feel like a theatergoer watching some play or movie, the idea would be to make the audience member feel just as if he was in some distant and beautiful place. The place depicted might be some place that now exists on Earth, some place that once existed (such as the Hanging Gardens of Babylon), or some imaginary place existing on some alien planet. The holographic projection could be created from actual earthly photography, or it could be based on some artificial CGI representation of reality. The latter would allow almost any possibility for the scene represented. By the time we had the technology for the holographic theater, photo-realistic CGI technology would be perfected. So inside the holographic theater, some imaginary and visionary landscape would look just as realistic as anything you might see in real life. On the Time magazine web site there is a long essay by Harvard psychologist Steven Pinker that seems to be dedicated to proving ideas such as the idea that your self doesn't really exist, that you have no soul, and that what you mistake for a mind with control over your muscles is really just an illusion. Unfortunately, the professor's case involves some serious warping of facts and logic. Below the title of the essay we see these words: “You exist, right? Prove it. How 100 billion jabbering neurons create the knowledge--or illusion--that you're here.” This is a completely bogus challenge. The existence of a self and human consciousness is an intuitive truth you can directly perceive. There is not the slightest need for anyone to prove such a fact of experience, any more than you need to prove that black is really black or that you can see something or that you can feel something. The burden of proof – in this case, an absolutely impossible task – is on anyone challenging the reality of such a fact of direct observation and experience. Similarly, if I see a mountain with my own eyes, the burden of proof isn't on me to prove that I have had a sensation – the burden of proof is on you if you make the weird claim that I have not had a sensation. In general, split-brained patients behave in a coordinated, purposeful and consistent manner, despite the independent, parallel, usually different and occasionally conflicting processing of the same information from the environment by the two disconnected hemispheres...Often, split-brained patients are indistinguishable from normal adults. Similarly, an article in Psychology Today says, “Split personality is a rare consequence of a split brain.” So clearly Pinker has his facts scrambled when he claims that splitting the brain with a corpus callosum surgery “creates two consciousnesses within the same skull.” In fact, it does nothing at all like that in the vast majority of cases. Even in the rare case when a split personality results, that is not at all “two consciousnesses within the same skull,” which is actually something that has never been observed. Split personality is a very rare case when someone alternates between one set of personality tendencies and another, not a case where two consciousnesses exist at the same time in the same brain. We might have a case of two simultaneous consciousnesses if someone's left hand wrote one essay and his right hand wrote a different essay, at exactly the same time (or if someone reported two simultaneous and unrelated trains of thought at exactly the same instant). Nothing like that has ever been observed or reported. Speaking of anomalous brain conditions, there are some of those that seem inconsistent with Pinker's claim that the brain is the sole cause of the human mind. As discussed here, Lorber found astonishing cases of people who functioned very well with very little brain tissue, after they had a disease that converted most of their brain tissue to fluid. The same link discusses how children with chronic brain seizures are sometimes given an operation in which half of their brains are removed. Astonishingly, they are typically able to function very well after such an operation. How are such things compatible with Pinker's thesis? Pinker makes no mention of such anomalies, but does take a quick stab at debunking observations that suggest that there may be such a thing as a human soul or life after death. Speaking of mediums, Pinker assures us that “attempts to contact the souls of the dead (a pursuit of serious scientists a century ago) turned up only cheap magic tricks.” This is not an accurate description of the experiences which scientists had investigating mediums a century ago. Although some fraud was exposed, some leading scientists got involved in the investigation of mediums, and ended up concluding that in some cases something much more than magic and fraud was going on. For example, Sir Oliver Lodge (an eminent physicist who made key developments in wireless telegraphy) spent a long time investigating mediums such as Leonora Piper, and repeatedly stated that he encountered something unexplained and authentic, and that fraud was not involved. Another eminent scientist was William James, known as the founder of American psychology. He investigated Piper and declared she displayed some type of paranormal knowledge acquisition. Piper endured more than a decade of rigorous investigation, was never exposed as a fraud, and was eventually declared to be authentic by an arch-skeptic (Richard Hodgson) who started investigating her with the hope of debunking her, but ended up saying he had “no doubt” Piper had provided evidence of an afterlife. Another top-tier scientist Sir William Crookes (the inventor of the Crookes tube that was the forerunner of the X-ray machine) investigated at length a medium named Florence Cook, and reported that she had produced authentic paranormal phenomena suggestive of an afterlife, had submitted to every test, and had never shown the slightest intention to deceive. Crookes also gave a favorable report on the medium D.D. Home after testing him. These scientists never retracted such opinions. Pinker also claims that “near death experiences are not the eyewitness reports of a soul parting company from the body but symptoms of oxygen starvation in the eyes and brain.” This claim does not hold water. Those who have had near-death experiences report experiences such as having a life review, coming into contact with some Being of light, traveling through a tunnel, seeing dead relatives, and seeing some heavenly realm. To explain that naturally, you would need something that produces hallucinations, with the hallucinations all being similar. Oxygen starvation (cerebral hypoxia) is a condition well-understood, as it is sometimes produced in pilots and mountain climbers. Medical references on hypoxia do not typically list hallucinations as a symptom. The symptoms of hypoxia listed here in a Federal Aviation Administration publication are “increased breathing rate, headache, lightheadedness, dizziness, tingling or warm sensations, sweating, poor coordination, impaired judgment, tunnel vision, and euphoria.” Tunnel vision is a phenomenon where you can only see what's in the center of your field of view, and is something entirely different from seeing yourself pulled through a tunnel, often reported in near-death experiences. So the only item on this list of symptoms matching what is reported in near-death experiences is euphoria. In short, oxygen deprivation is not a plausible explanation for near-death experiences. An RAF pilot named Allan Pring experienced oxygen deprivation while flying, and also much later experienced a near-death experience. He reported there was “no similarity” between the two. Pinker tells us, “Another startling conclusion from the science of consciousness is that the intuitive feeling we have that there's an executive 'I' that sits in a control room of our brain, scanning the screens of the senses and pushing the buttons of the muscles, is an illusion.” If Pinker is claiming here that there is no self that makes decisions based on sensory inputs, he is advancing a nonsensical thesis; and he does nothing to substantiate such a claim. There is not even currently such a thing as a real “science of consciousness.” You can get a PhD or master's degree in neuroscience (the study of the brain and nervous system) or in psychology (the soft and fuzzy study of the human mind), but as far as I can determine you cannot get a scientific degree in consciousness from any large college or university (the closest thing I can find to such a thing is an online master's degree in “Consciousness Studies” offered by a virtually unknown University of Philosophical Research). There is no scientific consensus involving “conclusions from the science of consciousness,” because such a science doesn't yet exist in any substantial and distinct form. Pinker discusses the “hard problem of consciousness,” the problem of explaining how a material brain can produce Mind, something totally different from matter. But he says nothing to give the reader any confidence that science is close to solving that problem, or even making much progress at solving it. Can we hope that such a day is coming, that perhaps when scientists scan brain tissue with a little higher magnification they will suddenly say, “Aha, there is a thought being produced”? Such a hope is not very plausible. What could you possibly see in a microscope or scanner that would be “the fingerprint of thought production” or “the smoking gun of matter producing consciousness”? We can't even imagine what we could possibly see that would be such a thing. Perhaps we should instead consider some other paradigm of explanation involving more transcendent principles. How Likely is Total Climate Doom? Are You a Mere Pawn of Physical Laws?